Engineering/Technology Diploma- Passed High School/10th Exam with Science & Math Subject from any Recognized Board. Management Diploma- Passed Intermediate/12th Exam with English & Hindi Subject at 10th/12th Level from any Recognized Board. Post Diploma in Computer Application- Passed Engineering/Technology Diploma in any Branch or Passed Graduation and Studied Physics & Maths Subject at 12th Level. Eligible Candidates can Submit IERT Allahabad Entrance Examination 2019 Online Application at the Official Website of IERT Latest by 3rd May 2019. Applicants First Open IERT Prayagraj Official Website. 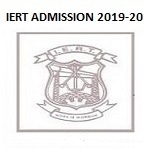 Click on Online Application for IERT Entrance Examination 2019 Link. Read Brochure and Check Eligibility Details. Now Select Course Link and Click Apply Now Link. Now Click on I Accept Apply Online Link.